In my previous post I mentioned how I’ve been out of touch with the goings on in the Lifestreaming arena due to the obligations of my day job. I started going through the feeds I have setup to scour for some new sites that had been released. It didn’t take long as I came across a post on mashable about a new site called Intuuch that had Lifestreaming written all over it. Reading about it piqued my interest quite a bit and I decided to go check it out…and just like that I was back in the Lifestreaming saddle again. The first thing I noticed when visiting the site is that they clearly took their design cue from Twitter with regards to the UI. I’m not saying that’s a bad thing, quite the contrary, it will make people feel very comfortable with the familiar look and feel of the site if they’re already a twitter user. It was time to enter the oh so critical, make or break portion of any Lifestreaming site, as I registered and went to create my account profile. The account creation work flow is an interesting one as the registration page also prompts you to enter all of the network profiles you want to add to the service. For the Lifestreaming neophyte (and the privacy fearing crowd) this may be a bit scary without a clear description of the site’s purpose and what they plan to do with this information. As with many of the newer sites as of late, services are added by providing your user / account name on the service. This continues to be a welcome departure from the earlier days (yea I said it…some of us are veterans now:) where sites had you provide the RSS feed for the service you wanted to add. I’m also guessing that this allows the site to use either the feed, or API where available, to pull in data and as networking sites provide API’s moving forward they can make the graceful switch on the backend. Most of the usual suspects are supported including Twitter, Flickr, Del.icio.us, last.fm etc…but the ability to add an RSS feed for a site not supported is lacking*. Why the asterisk you ask? Well that’s because they do support your Feedburner account. So you can get around this limitation by burning a feed for a site that isn’t supported into your Feedburner account which will then show up in your profile. My guess is that they have determined that maintaing feeds using Feedburner allows them to be manageble without having to deal with the unknowns of allowing any RSS feed to be added willy nilly which I’ve seen cause issues at other sites. After account creation there are several other settings you can edit. Most of them are pretty common with the exception of allowing you some design changes to your profile page with regards to color choices. Once complete your profile page will then display your Lifestream based on the services added. As I’m writing this I still only see a handful of the profiles I’ve added appearing on my page. Only 6 items from 5 of the 10 services I added. I’ll have to monitor this as the adage “less is more” is not what I’m looking for when I create a Lifestream. I can only hope that they’ve setup a polling schedule to pull data later, but this could be a make or break feature if I don’t see more data soon. Friendstreaming (the ability to follow your friends Lifestreams) is one of the more compelling reasons to use this site. Once again ala Twitter they provide a “Public” page which shows all the stream data in real-time being added by users of their site. You can then either add existing users or invite your friends to join and offer up their streams using the “Friends” tab to make it easy to follow each other. I know, it’s a pain to bug your friends to join and setup there streams blah blah blah. Well perhaps that’s the case, and perhaps most of your friends are also using Facebook. If that’s the case, you’re in luck because they also offer a Facebook application to make that process less painful. I actually went ahead and added it as an app to my Facebook account. I can safely say that it has been the cleanest and most graceful implementation of an external site I have seen yet ported over to Facebook. Lastly they offer a nice selection of widgets you can use that include Image, CSS/script, and iFrame flavors for you to choose from. 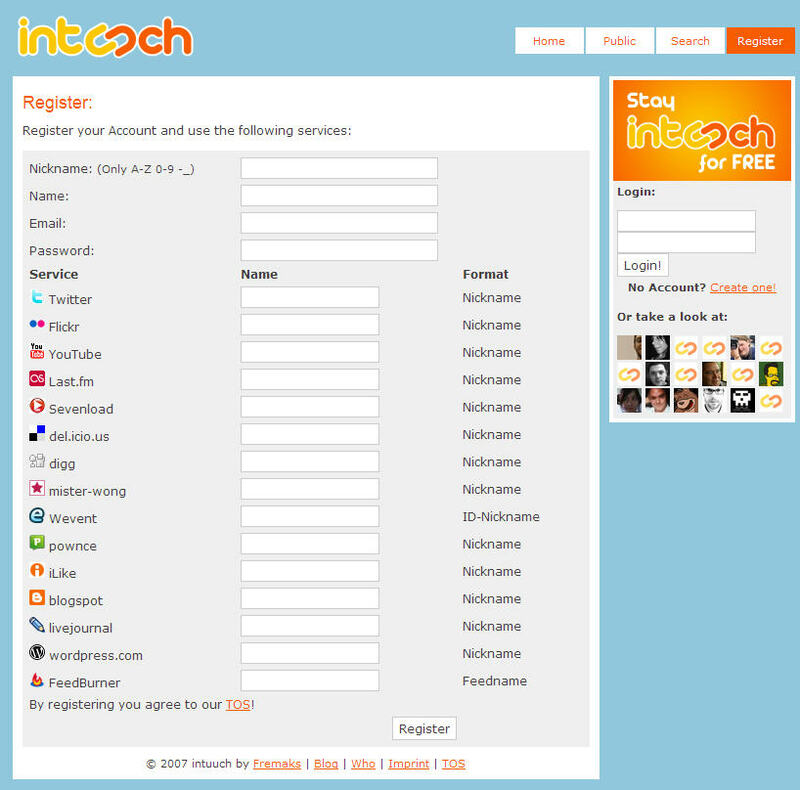 It’s been quite a while since I’ve reviewed a new site and it was a pleasure to have come back after so long and found Intuuch. This site is very promising. I really hope the issue with the lack of data being pulled from my services (and this isn’t a minor issue) is corrected. The clean and simple interface, friendstreaming functionality, and ultra impressive Facebook integration make this a very solid product that I highly recommend trying. In general I agree with your review. Intuuch is a nicely implemented approach to lifestreaming. You don’t mention the filtering, which allows you to hide any feeds you don’t want to show. I haven’t had the issues with data not showing up but I have run into some issues with the Facebook app. Because I already use Facebook apps such as the official del.icio.us app, I am getting duplicates in my newsfeed and mini-feed. I thought hiding these would take care of the issue but it doesn’t and worse, it means that they have to be hidden on the main intuuch site. Better would be the addition of a preference setting to the Facebook app that allows you to choose which feeds show up in your newsfeed and mini-feed on a case by case basis. I have written to the developers to request this. As you point out, they also need better support for RSS. In addition to RSS in, I’d like to see RSS out (like Plaxo Pulse) so I could bring the whole thing into my newsreader. These minor criticisms aside, intuuch has hit upon the right combination of ease of use, elegance, and timeliness. I wish them luck with it and plan to use it. Looks interesting. Thanks for the review. It is disappointing that Intuuch doesn’t have links back to the origional sources. Like there is no link to http://del.icio.us/krynsky next to the Apple store link. Lee, thanks for providing some great additional info there. Ozten, that’s true, they should provide links to the profile home pages for each source a user has provided. As a followup to my earlier comment. Since Facebook apps give you the option not to have information reflected in the newsfeed and mini-feed I have decided to experiment with going the other way round and letting intuuch handle the job for those services it supports. I’ll report back on how it’s going. The big advantage is that you then have a working lifestream outside of Facebook (which unfortunately excludes Facebook info) that you can direct people too. Seems like the best of both worlds. 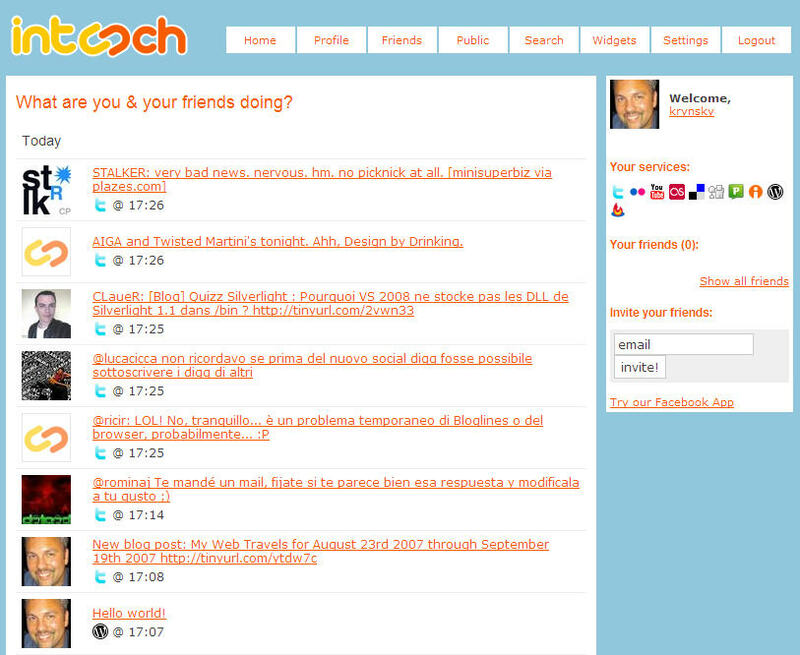 Readr is pretty good but I think the Twitter-like interface of Intucch will be easier for people to adopt. A lot of the other lifestreaming services treat a lifestream like it is a blog. I personally want something much simpler and transportable (which is why I am calling for RSS out). Plaxo is on the right track with Pulse. My initial enthusiasm has waned a bit. The developers have been unresponsive to the many problems I’ve been having with intuuch and haven’t answered my many questions. I have gone back to letting third-party Facebook apps update my newsfeed and mini-feed. 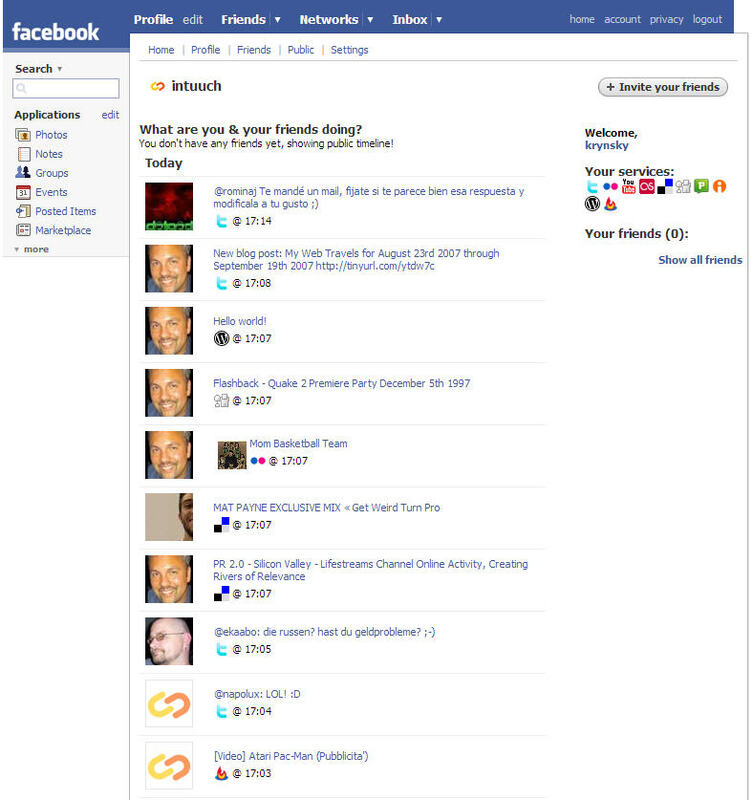 My main gripe with intuuch is that I can’t figure out how you add friends streams and although they have a Facebook app, your friends there don’t seem to be linked in any way to your friends on intuuch. In other words, my wife and I both have intuuch accounts, we both have intuuch installed on Facebook, and yet we can’t see each others streams and I can’t for the life of me figure out how to make it work (and I’m a tech journalist with 15 years experience with this stuff). Have you seen FriendFeed. This new lifestreaming platform, from ex Googlers seems to address many of the issues raised here (they do link back to the original source and they seem to have a much better handle on the viral aspects of adding friends. They have solid backing as well so I’m placing a bet that they’ll be around in the future and I’m not so sure about intuuch. Maybe it is just that they are in Europe and I’m in the States but communication with them has been more difficult than I would’ve hoped.